October 1, 2012 October 8, 2012 Satis109 Comments on Thought of the Week: What’s Going on in There? Thought of the Week: What’s Going on in There? I may not, in fact, be entirely sane. What’s that? You already knew? How insulting. Okay, fair enough. Most of us are pretty whacked out at times, and sanity is in the eye of the psychologist. Although I kind of think they’re nuts too. Who does a therapist go to for therapy? Is there some kind of super-therapist? Maybe Batman goes to see him. Anyway, it occurred to me quite some time ago that my brain is up to no good, and I’m the one stuck with the consequences. For example, sometimes my brain tells me that my life is not worth living, that I’ve brought nothing but pain and misery on everyone around me, and that they’d all be better off if I didn’t even exist. Anyone else ever have those thoughts? Congratulations, you’re insane too. Other times, my brain tells me that it’s a good idea to lie down on the floor in a ball while my wife screams at me to stop lying on the floor in a ball. It seems to think that she’s using some kind of reverse psychology, and in fact wants me to stay down there. Just to make sure, my brain won’t let me move for several hours afterwards. If I try, it makes my tummy feel bad. Takers, anyone? Maybe you’re slightly saner than you thought. There are, of course, the times when my brain lets me think that things are going all right, that life is good, and that the writing I’m doing is strong. It even convinces me that just around the corner, if I hang on a little bit longer, might be fame and fortune as a world-reknown author. In the words of Homer Simpson, Stupid brain. Now scientists are doing some pretty awesome stuff at working out just what’s going on in there. They discovered that the funny-looking wrinkly lump of gook inside your head is actually an incredibly complex network of neurons and connections, forming literally trillions of possible pathways for electrical conductivity. Sort of like the wiring in our basement. They worked out that this little bit of the brain in the back called the cerebellum is responsible for motor control. If this bit gets damaged, you can’t really move anymore. There are some pretty nasty genetic diseases that do this. They also worked out how the neuronal system works (sort of). Ions pass in and out of the neuronal cells, carrying charge with them. When the charge reaches a joining point, it makes the cell spit out a whole host of chemicals so that the next cell can pick them up. These chemicals, or “neurotransmitters” (big air quotes), kind of make sure signals go where they’re supposed to. 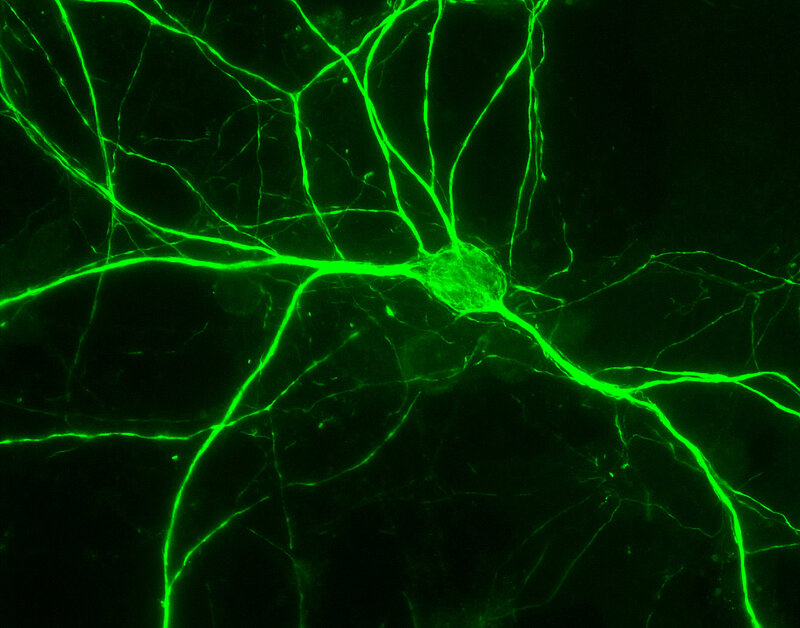 Sometimes the insulation on these neurons breaks down, and the charge sort of leaks out. This means not as much gets to the next cell, and all sorts of things go wrong. Multiple sclerosis does this. And sometimes, the brain just messes up completely, and spits out too much neurotransmitter, or not enough, or the wrong damn kind. Now, figuring out why this happens is still being worked on. Ironically, some of the drugs that are supposed to help with this aren’t even fully understood themselves. Chlorpromazine was intended as an anesthetic in the fifties; it turned out to be more useful as an antipsychotic in schizophrenic patients. So we’re sort of trying to figure it all out. The scientists are working on it from a chemical point of view (my wife conducts research on a particular type of chemical sensor with important roles in learning and memory); the shrinks are working on it from a cognitive point of view; the priests are working on it from a god point of view. But in the end, my brain is still kind of messed up. It makes me do these pretty odd things, like repeating phrases over and over again, shaking when I’m upset (getting upset, a lot), feeling generally miserable and depressed, actually enjoying feeling miserable and depressed, and consistently doing things that I know are going to cause major problems down the line. I checked it out; I don’t really quite fit depression; I don’t really quite fit bipolar; I don’t really quite fit asperger’s; I don’t really quite fit schizophrenia (I have an uncle who is, though; he barks at the moon and is otherwise a lovely guy). It could be some time before someone works out what’s going on with my brain. It could be the scientists; it could be the shrinks. It could be my wife, though I think she’d just as much rather I get rid of the damn thing entirely, and upgrade to a new one. I sort of agree – it is getting a little long in the tooth. Until then, though, I guess I’ll just let my brain figure itself out. If it can’t, it’s no membrane off my frontal lobe. Hey – maybe your brains can help! What do you think my brain is up to? If your insane then i need to be put in a hospital for some of the stuff i do. p.s. tell your uncle i howl at the moon too. Why, thank you (I think)! It’s nice to know one is not alone. I will be sure to let him know next time I see him. I would say that, wouldn’t I? I could go even further and say, “Just ask Jesus–He already gets it.” But that’s probably a little much. I too feel most of what you described. Good to know that. As you said, It’s nice to know one is not alone. Absolutely. Among any aspect of depression, one of the worst parts is the feeling that you are completely alone and isolated in the world. Ironically, I was reading an article the other day about how depression actually was an evolutionary advantage to our ancestors; they believe it might be linked to the immune system. When someone got sick, they’d become depressed; in isolating themselves from others, it ensured the rest of the tribe wouldn’t get infected. Sadly now people cough on your face even if they are sick. At least people i have seen, do so. But yes finding people who are like you is a good feeling. But knowing that you are somewhat unique is a better feeling for me. It’s a balance of both, I suppose. For a long time I took pride in the depth of my depression (I know, that sounds weird, doesn’t it? ), and that I was ‘more’ depressed than everyone else. Yet at the same time, it’s nice to feel slightly less alone. Pingback: Thought of the Week: What’s Going on in There? | Psikologi Parmad Fika..
You’re welcome. I’m sorry to hear about your difficulties; I sincerely hope that you are able to find a cause soon. One of the key rewards for my wife in her research is the implications of genuine help and cures for people like yourself. You know, that’s a really interesting perspective. There are psychological anthropologists, but often psychology’s history stops conclusively with Freud. Ironically, it feels like not a whole lot is genuinely understood about the so-called lizard brain, the part that drives our most basic instincts. Iḿ a psych student, and i would like to think that psychologyś history starts with freud! 🙂 his discourse kind of gave birth to all other theories, like jung’s and maslowś… and regarding what Michael said, I feel that what psychology is trying to do is instead of focusing simply on biological aspects, it tries to balance it out with what is happening with the environment as well, like how our relationships and personal histories affect the way we are today. and besides, psychology is too broad for it not to take ancestry into consideration (there is afterall, evolutionary psychology, biopsychology, etc!). Otherwise, i enjoyed reading your post! 🙂 iḿ feeling quite…insane right now as well! cheers! Is anyone really totally sane today? So much is going on in the world, I wonder if anyone is really totally sane. I suspect you’re right; sanity is a matter of perspective. The bizarreness and quirks are sometimes the things that get us through life. Reblogged this on Heet Pandya. I can’t ignore the fact that the Homer Simpson is so funny! I love that diagram of his brain! The Simpsons is one of my favorite TV shows. Well in that case, welcome – and thank you! Nice to know that we aren’t alone in the insanity. Thoughtful post that I believe many of us can relate to. Thank you! I have a number of friends who find comfort in relating to others with various difficulties and mental issues. Even if we aren’t all nuts in the same way, it almost becomes a kind of community of crazy! Well, the first problem that comes to mind is having a wife who screams at you when you’re acting crazy–like screaming ever made crazy better. Maybe the wife could learn some more effective coping skills? You tell us what you do and what you think, but not enough of what you feel. So it’s hard to say what’s really going on in your brain. Doesn’t sound like much fun though. Thank you. It’s easy to make light of it in retrospect, but obviously it’s extremely difficult to cope with at the time. I am on medication to stabilize my moods, and am seeking therapy. Don’t misunderstand me – my wife is kind, and I respect her very much. She’s not angry when I get like this, but rather is worried, both about myself and about our son. It’s also very difficult for her to live with someone who has mental breakdowns on such a regular basis. When I say she ‘shouts’ at me, she is persistent in telling me to get up off the floor, or to just get something done. It sounds like harsh love, but the truth is that in a way, it’s helpful – she does get me moving and doing things again. If not for her, I would be catatonic on the floor for much, much longer. I can’t say I’ve laid on the floor like that before but I’ve had plenty of negative thoughts and had a mind that sometimes seems to just fixate on unhelpful solutions. My saving grace has been Brazilian jiu-jitsu. The sport allows me to turn my brain off and relax for a bit, and when I come out of the gym I have a refreshes mind ready to face issues with the boost of post work out endorphins. There was a study done on grappling that showed it to be effective (even more so than regular exercise) against combating stress and stress related illnesses. This may not be the answer for you but it couldn’t hurt to look into if you are able to with your current illness. I completely understand where you’re coming from. There’s a wealth of research on the effects of exercise and the brain, and I will admit to feeling a lot better when I go to work out. The difficulty is in working up the courage to go and work out in the first place! I completely understand that, it can be really intimidating to go into an unfamiliar place. Funny story. . . I used to be kind of nervous about going into a coffee shop and reading. How stupid is that? I have no idea why I was so nervous but it made me just feel uncomfortable. However, once I got inside and sat down I realized something. Everyone was reading! I actually heard a person speaking on a radio talk show a while ago and he said something to the effect of “you should go out and do things that take you out of your comfort zone. If you aren’t doing something that makes you feel at least slightly uncomfortable or new then you aren’t living.” I thought that was pretty cool. Your writing is already making an impact. I hope it makes you feel better, knowing that you are not alone, and that even though our society is extremely judgmental we are all victims of crazy. Embrace your insanity, it will keep you sane. An extremely helpful point of view! I will admit that I don’t particularly want to be ‘better’, in the sense of behaving according to a strict stereotypical social norm. All I really am looking for is to have a less harmful impact on my family. It is indeed encouraging to think that I’m able to reach and touch people through my writing. Thank you. Trust me i dont even get the whole concept of appropriateness, and sanity… what?are we all supposed to act in similar fashion? is that y we were made so different? i mean we r not a result of some mass production, which SHOULD have standard traits… i dont get ‘shoulds’ and the ‘have to’s’ anymore… and i know i m not insane… even if alot of what i do may not be accepted,… but i wasnt really looking for your acceptance and acknowledgement, let alone appreciation, thank you very much!..screw you for wanting me to act in a particular manner… and the ‘you’ here is ofcourse not for you… but dont worry man we r all inappropriate and insane on some level.. Awesome – approved to act like a nut (which, of course, I do already)! I completely agree with you – the best people in this world are inherently those who buck the trend, and simply do what they want. They might be seen as insane, but some of my best friends are just are off the wall. I think the tell tall mark of someone who is insane, is someone who does not think they are insane when indeed, they are insane. The fact that you react and respond to things with a rational mind, examine yourself, as well as the reactions of others, and wonder if there is something “wrong” with you, means that you are in fact, probably, more “normal” than not. I think society has evolved a sort of pattern for us.. when one stray’s from it, the people that do not, look at him/her like something is “wrong” with them. Perhaps the feelings that you are having, and the emotions you experience are signs that you need to continue to be who you are, expressive, sensitive, and introspective for a reason, a real good reason, even if it remains unclear to you right now…. A person who lives with such extreme emotion will, without doubt, feel alone at times, and grow tired of how much work it takes to get through each day feeling like your about to break… but in the end, your uniqueness and strength that comes from this way of life will deliver you a deeper understanding for what this life is all about. You’ve just made me smile; peering through the humor, you’ve got yourself a fairly good insight into who I am. I certainly hope that I will one day work out what it’s all about; some days things feel like they’re all clicking into place, while others feel like everything’s falling apart. In the end, the world keeps turning regardless of what I say or do, so I usually tell myself that I might as well go along for the ride. I appreciate your thoughts; they’re actually quite touching. And thanks for the vote of confidence! Thanks for the many Simpsons references (and the one picture), took me back, indeed. And also, insanity, meh. I thought that the world was insane my whole life. I grew up, and then the bastards (the general world) told me that I was the insane one. Bah! I might spend excessive amounts of time (the longest was two years) wishing for Mr Reaper to tap on my shoulder, but hey, it’s all relative. There’s nothing sane about sanity, I don’t think. Agreed. The Reaper’s always just around the corner (interesting thought…this is kind a part of my book); the darkest times are when you become obsessed with it. There are so, so many things in the world that just don’t make sense, it’s hard not to see it as being all a little messed up. Some of us, I guess, are just a little more messed up than others. And yes – I love the Simpsons! Disclaimer : I really know nothing of psychology, and am probably nuts myself (aren’t we all?). Also, the assumption above could be way off mark, which would probably build the case for my own stupidity! Heh heh. First of all, thank you so much for the compliment. I was blown away to be chosen for this. Secondly, sorry to disappoint, but I’m not a psychologist, or indeed knowledgable about psychology other than being on the receiving end (i.e. in therapy). However, mental illness and the struggles it creates with have been a part of my life for a long time. I try not to burden people with difficult writing, though if you want to see the dark and serious side of things, check out A Gothic Symphony at the top (a novel I’m working on dealing with these issues). I appreciate the comments, and the thoughts. I probably am overworked – I imagine most everyone is these days. You have a deep insight here, and are most certainly not stupid. And I appreciate the empathy! A very timely post, especially considering we’re coming up on the time of year when some of us could spend most of the day inside, not wanting to do anything but sleep. For my own part, it’s not really what’s going on in my head that bothers me, it’s how to get it to come out in an intelligible way. (Judging by the Debates this week, I’m not alone in that.) Drawing helps because it gives me extra time to organize my thoughts and throw out all but the best material. Writing is very much the same thing for me. Working on my novels gives me a chance to let my mind drift into other worlds, which ends up taking me away from some of the things that bother me so much in this one. I hadn’t actually considered the autumn/winter side of things, but you’re absolutely right; despite being my own personal favorite time of year, a lot of people are disaffected by the weather and lack of light. And yes…the debates have been showcasing certain difficulties in expressing ideas…! Hi Satis, please don’t take this the wrong way but it seems like you are running away from the realities of the world to ease the tensions they cause you. Your hiding from these realities will not make them go away. The world needs people like you who care enough to stress themselves to insanity. Use your energy in a positive way and make a difference in this world. Pick a thing, anything, have a strong vision and you will achieve it. Take care. No taking wrong ways here! Thanks for your comment. There’s probably a lot of truth in the idea of running away from reality, especially when things tend to get a little overwhelming. I absolutely focus my energy on positive things when I’m able – the difficulty is in finding the courage to do so. I’m flattered! Trying to self-analyse one’s madness is probably a sure way to drive oneself mad! Do you mind if ask what sort of research you do? You know, that sounds awesome! Congratulations. The work my wife does is linked in some ways to autoimmune disorders (she works specifically with NCS-1, which is turning out to be involved in a whole bunch of things). I hope your degree goes well for you! I’ve always howled at the moon. And I think I am perfectly normal. 🙂 Very excellent post. Heh heh. I’ve thought about it, but in the end I just stare at the moon for quite some time. Half werewolf, by any chance? I don’t know whats crazier, howling at the moon or thinking that it is normal. jk, enjoy your howling. Totally. What about the person who howls because the other one’s already howling? when I was in University I had one psychology test and they told me (controlling their burst of laughter) that I was half insane, that was around ten years back and I think by now I would have touched the full versions of madness. But I am glad with my insanity(which is my blogs name too), there are billions of sane people out there , controlling and managing the world and look what they have done to it!!!!!! I love your outlook on that one…though I’m not entirely convinced the folk that run the whole are entirely sane themselves. I’m curious to know what kind of psychological test would produce a diagnosis of half-insane! And I agree – the things that make us a little off the wall are often the things that drive us through life. I must say, that sounds like quite a good idea. In truth, most mornings I do feel better, even after a chaotic night. Sleep is a big thing for me – I fall asleep too easily sometimes, and never quite get enough. However, it certainly is relieving! Ha – I know the killing feeling pretty well. I can’t say I swing back and forth quite so quickly, but I know a couple of bipolar friends for whom this is a huge struggle. In the end, as long as the ups seem to balance to downs, I guess everything evens out in the end. Thank you! There’s a touch of nuttiness in all of us. I’ve heard that…would an insane person believe it? I’ll be looking up that book – thank you! Congrats! You’re among good company, judging by the comments. 🙂 Normal people believe that insanity is something to shun, but I feel we should embrace it and fly our freak flags with pride. After all, isn’t that what makes us unique? As for what’s going on in your head have you considered that the voices that come from outside of your head are competing with any voices from within? For example, the voices outside of my head that come from my husband and bonus-son override the voices inside, which is making me more than a bit insane as they never remain quiet, even in their sleep. This has caused me to write poorly written blogs which haven’t been published thankfully and make irrelevant comments on random blogs. Good luck with finding your sanity, if you so choose, but I’m enjoying your sanity-free blog as-is. I appreciate the compliment (I think)! Ironically, I’m the one who keeps everyone up at night. I agree that the quirks and oddities that define us are nothing to be ashamed of; at the same time, though, I do feel a responsibility to my wife and child not to cause THEM fear and stress and anxiety. It’s a tenuous position. Because of my own idiosyncrasies, I actually end up with time on my own – hence writing, and these blogs – and it gives me a chance to let my head explode in relative safety. I’m sorry to hear that things seem stressful for you; sometimes just the everyday things are the ones that really get to you. I still have near-panic-attacks when it’s time to do the dishes. P.S. 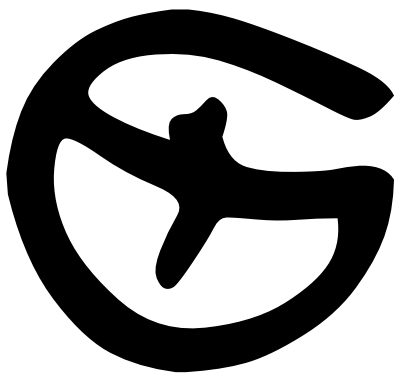 Love the Dharma logo! Neuronal system? Nah, that’s too scientific. I’m pretty sure that my brain is like a small town -I’ve got suicidal people, the local drunks, the workaholics, the lazy buggers, the naturalists and haters, the optimists and pessimists, the happy lunatics and generally crazy people.. oh and the genus (it’s only one, there was no more space left really). So in every given day one of those groups decides to go on a strike so it’s heard by the local government… So on this given day they dominate. As you can guess every day is different. I absolutely love the way you picture your own mind. I’ve read a little about visualizing your own mentality, though when I think about it it usually looks like a jumble of shapes and colors and chaos. There’s a lot of people in your head (you don’t suffer from DID, do you?) – it sounds like you’ve always got company, at least! If everyone is totally sane, that would mean the world is perfect. I think we have a long way to go on a “perfect world”. Love your humor! Why, thank you, my dear! No…the world is far from perfect. The great thing about it is that it lets me pretend that I’M perfect by comparison (sometimes)! Reblogged this on Dea Deol's. Thank you! Nice to know everyone seems to be a little nuts in one way or another! I’ll be checking out your blog shortly. great post… i had to go through therapy when i was a kid. I totally know what you say insane. I’m sorry that you were in therapy as a child; I hope that it helped with whatever troubles you had. Its so awesome that all us insane people can meet in this one place,now that’s progress! It’s like one giant, digital madhouse! I’ve lived together with someone exactly like you described yourself, quite long time and I came to the simple conclusion that, this is not a sickness or anything of that sort, but probably just another way of functioning of our biology. Never thought it was good or bad or depressing, but just tried to think what if most of the world’s mental state had disorder and only some of us have reached the sanity, and more important is, what if most of the data the psychologists take reference for categorizing our mental states were completely visa-versa? You know, it’s a very difficult thing to make a decision on – whether it is genuinely an illness, or it it’s just “how we are”. For me, the only real reason I am seeking therapy and taking medication is because I recognize the damage my behavior is having on my family. My son understands about the difficulties I have – I’ve made sure to explain it to him, so he doesn’t grow up thinking it’s all his fault – but when I go into a rage, or cower whimpering in a corner, he gets very upset. For that reason alone, I would want to get ‘better’. If I were on my own, however, it might be a different matter…! If we had a child with him, I’d follow your way. It must be difficult trying to deal and put in order both your feelings/behaviours and your child’s at the same time. Thank you. Recovery’s a long road, but both my wife and son have said they’ve seen an improvement since I started taking medication. I hope it continues. Love it! Nut-jobs have to stick together, or maybe we should run from each other I don’t know. Hmm…there are so many of us by know, if we all ran in opposite directions we’d just meet another crazy! Sticking together sounds like a plan. But then there’s the thing about social conventions or lack there of and who is going to get the bean dip and which one of us feeds the leopard that that one REALLY crazy dude dropped off and who keeps leaving the “f-ing” soap in the freezer!?! IDK, but it would most assuredly get boring real quick. Strange coincidence. 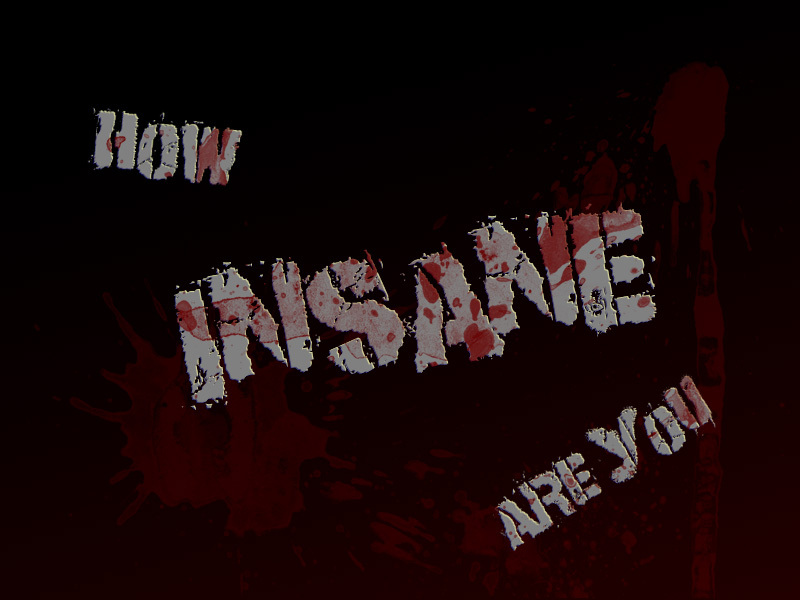 I also write a bit about being insane and I also chose the Imbalance 2 style blog! Great to see such an outpouring of oddities and strangeness. Ha! I never even considered the fact the theme was called “Imbalance”! I just liked the way it looked. Perhaps there’s something in the design that appeals to us! I’ll check out your blog in a moment. I’ve never heard MS described that way. I sort of like it. . . as much as one can like a description of MS. Congratulations on being Freshly Pressed. Great post! Thank you…sort of! The basic cause of MS is the breakdown of the myelin sheath surrounding neurons, I believe. And thank you for liking the post! Oh, geez…I’m sorry. A little tactless, then. I know there is good research happening in that area, but I don’t think it’s led to any particular viable advancements so far. Thank you nonetheless for appreciating my humor! Not tactless at all. I write occasionally in my blog about some of my funnier mishaps. If you can’t laugh at yourself most of all, that’s a sorry place to be! Everyone loves Homer Simpson, and great article, keep it up! Thank you! Sometimes I think he’s wiser than the best of us. Thank you! If you have to think about your insanity, you’re definitely not stupid. I enjoyed your post. You might want to check out the book ‘The Self Illusion’ (http://amzn.com/019989759), which essentially says we don’t exist – this might get you off the hook with your wife. I found it somewhat comforting to know I didn’t exist, but then where are all the dirty dishes coming from? That’s so funny – I wrote a post a while back that was pretty popular on Descartes, and the concept that none of us may actually exist. I also decided that at some point, I’d like a house elf. hurray for weird people who dont understand themselves and their brain. the brain’s kinda weird but that doesnt mean we’re crazy, right?. normal people might be the ones who are crazy, from a crazy man’s point of view. ooh, perspectives. Indeed – especially multiple perspectives, which thanks for Freshly Pressed I’ve got plenty of here! Hey, wouldn’t it be really crazy if all those replies were really just me, in different personas? HAHA. well itd be too crazy creating multiple wordpress accounts. but hey, the things we do for bein crazy!